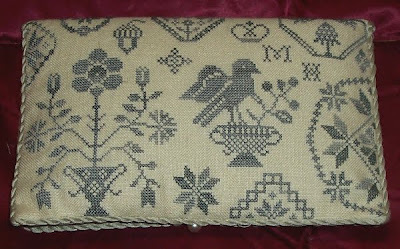 Marian H. from Baton Rouge, Louisiana stitched this lovely version of Quaker Schoolgirl Needle Necessities in 2007. Marian wrote, The kit was made with the materials called for. The thread color was perfect. I completed it myself. It took several days for me to get my head together to decide I could do it. Once started, it was a breeze. Really no different that putting together a Christmas ornament. 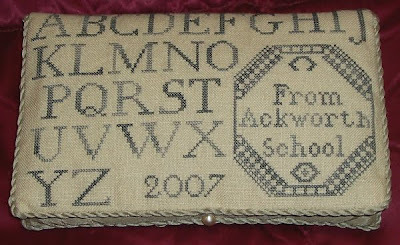 I love anything quaker and would really like to visit the Ackworth School. Hopefully one day I will. 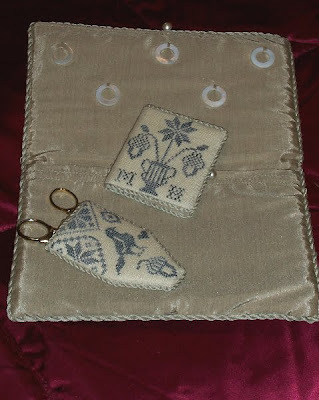 I’m almost ready to complete the "Fair Maiden’s Etui". The stitching is done. I just have to backstitch two more triangles. Again, I thought I might have trouble putting it together, but I think it’s firmly in my mind now. I have all the materials ready. Just need to finish the backstitching. I won a bet on the game last night and my prize is to be a piece of Silkweaver’s linen. I’ve earmarked it for your strawberry needleroll! Thanks, Marian, for sharing photos of your lovely workmanship. Sounds like we'll have some more photos from you soon! I certainly hope so! That really is gorgeous! Marian does lovely work, and this is no exception. Beautiful! Ellen, I love this! It's realy gorgeous! You're genius! She has done beautiful stitching and finishing! WOW!! I love that and beautifully finished. Great work and so neat finish! Wow! Such beautiful finishes! Really enjoy looking at your blog. Thanks so much for sharing!